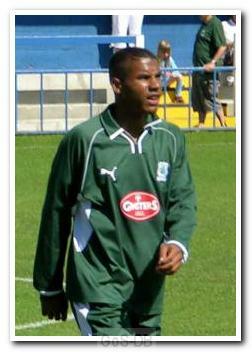 Bristol-born Reid joined Argyle in 2005 after his performances for Millfield School in their Independent Schools' Cup victory led to trials with Manchester United and Crystal Palace. Having turned down the chance of a professional cricket career with Gloucestershire, he impressed in the Argyle reserve and youth teams, scoring regularly. He was given his Argyle debut by Tony Pulis in the Championship but was handed his first full start by Ian Holloway, who rated the young forward highly. Following his first start for Argyle he then joined Kidderminster Harriers on a short-term loan, but returned early after he was sent off playing for Harriers. Reid then joined Rochdale on loan but again returned early for disciplinary reasons. 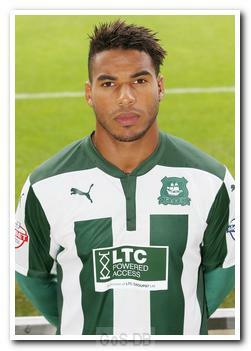 After loan spells with Torquay United, Wycombe Wanderers and Brentford he was released by Argyle and moved to Rotherham United. After 18 goals in his first season at Millmoor he was snapped up by West Bromwich Albion, but despite two years at The Hawthorns he made just four appearances without scoring and was loaned to Peterborough United (13 games without scoring) and Walsall, for whom he scored three goals in 18 games, including a debut strike against Argyle at The Bescot in the Saddlers' 2-1 win in August 2010. In January 2011 Reid moved to Oldham Athletic (7 goals in 39 appearances) but was released along with eight other players at the end of the 2011-12 season. Keen to return nearer to his Bristol home, he signed for Yeovil Town on a two-year deal in July 2012 and again gave Argyle a reminder of the goalscoring touch he had developed since leaving Home Park by netting a hat-trick in a 5-0 pre-season victory against the Greens at Dorchester Town's Avenue Stadium, a match in which Gozie Ugwu was his strike partner. Having played 19 times for Yeovil and scoring 4 goals, he was signed by new manager John Sheridan on a one-month loan deal at the end of January 2013, reuniting with fellow loanee Ugwu. With the loan extended until the end of the season, Reid helped fend off the threat of relegation from the Football League, and in June 2013, Yeovil and Argyle hammered out a fresh deal to keep him on loan at Home Park until the end of the 2013–14 campaign. 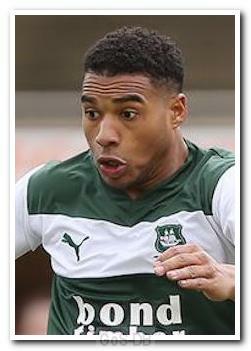 In 2013-14 Reid became the first Argyle striker to score over 20 goals in a season since Tommy Tynan's 26 in 1988-89 (Steve Castle netted 22 as a midfielder in 1993-94). He also became the first Argyle player to score a hat-trick since Vincent Pericard in 2006, after hitting a treble against non-league Lincoln City in an FA Cup 1st Round replay in November 2013. Unsurprisingly voted Argyle’s Player of the Year for 2013-14, he returned to Yeovil for the formalities of being released and after several weeks of intense speculation, he signed a two-year deal at Argyle in June 2014. Reid added to his burgeoning reputation by chalking up another hat-trick, 15 months after his first, with three goals in the 100th competitive encounter with Exeter City in February 2015. This time it was the club's first hat-trick in the Football League since Pericard's treble nine years before. Reid's triple strike was the first by an Argyle player against the Grecians since Raymond Bowden in 1929 and only the third ever. 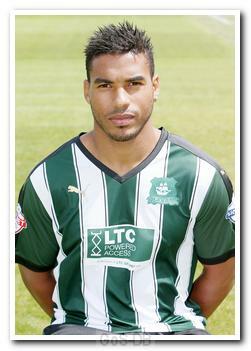 It was also the first by an Argyle man at St James Park. Injuring his foot in his St James Park heroics, Reid had a frustrating end to the season and was clearly playing through pain. Further injuries reduced Reid's match count but in March 2016, on his return to the side following a spell out, he netted his 50th and, as it turned out, his last goal goal for Argyle. Two months later the 28-year-old turned down a new contract and joined a select band to have played for all three Devon clubs by signing for Exeter City, for whom he scored 22 goals in 67 appearances across two seasons. He then moved on to Football League new-boys Forest Green Rovers in January 2018 on a two-and-a-half year deal, scoring the winner on his debut.